The best homemade cinnamon rolls ever! If you love gooey cinnamon buns, here’s the secret ingredient. Everyone raves about these homemade yeast rolls. You may also love our orange rolls! It’s been almost 5 years coming. The girls didn’t want me to do it, but we’re finally sharing our secret ingredient cinnamon rolls. The from-scratch breakfast sweet rolls that everyone craves. Gooey homemade cinnamon rolls. Our best recipe that we’ve been serving friends and family on holidays and any other day for over 12 years. We’ll get to the secret ingredient, but let’s start right into how to make these sweet rolls, because I know you don’t want to waste any time. The exact directions and rising times are in the recipe box below, but here are some hints for making cinnamon rolls. When I originally set out to make the best cinnamon roll recipe, I started with this bread dough. Over that year as I tweaked the recipe, I made the dough just a tad bit sweeter. The ingredients are very basic. I like to use Red Star Platinum yeast which is an instant yeast. This means you don’t have to let the yeast “proof”. If you don’t use instant yeast, be sure to allow the yeast to proof in the warm milk until it is frothy. This will take an extra 5 minutes or so. Be sure that your milk is warm to activate the yeast, but not too hot so that it kills the yeast (about 105-110 degrees Fahrenheit). You’ll also want to warm the butter so it is soft and mixes in easily. Bring the eggs to room temperature also by placing them in a glass of warm water before adding them to the mix. If the ingredients are not cold, they’ll help the yeast to do what it needs to do quickly and give a beautiful rise to your cinnamon rolls. After you have the ingredients added, it’s time to mix the dough. In the video I use a stand mixer to mix the dough. If you have bread machine you can use the dough setting to make this extremely easy. Or, go the old-fashioned route and get those hands working by kneading the bread without a mixer. Any way works. If you decide to knead with your hands, be careful not to add too much flour. The dough is supposed to be tacky, which is what keeps these homemade cinnamon rolls soft. Again…it’s important to note that the dough will be tacky and soft. It shouldn’t completely stick all over your hands, but if you touch it should feel tacky and not dry and floury. Don’t be tempted to keep adding flour! We use three ingredients in our homemade cinnamon rolls filling: softened (almost melted) butter, brown sugar and cinnamon. You can add a touch of vanilla extract if you’d like. We find it’s not necessary, but feel free to do so. Mix this all together while the cinnamon rolls are rising. This only takes a few minutes! After you let the dough rise in a greased covered bowl until it is double in size, you’re ready to roll the cinnamon rolls. Use a pastry mat sprinkled with flour to keep the dough from sticking. Remember…the dough will be tacky and this is the point where it is ok to add flour on the pastry mat and on top of the dough itself for easy rolling. You’ll find this dough is very easy to roll out. If it is too much of an arm workout, you’ve most likely added too much flour. After you’ve rolled the dough, spread the cinnamon filling on top and roll-up jelly-roll style. Cut into as many rolls as you’d like. We like to do 12 rolls for a 9×13 pan (which end up deliciously large!) or if we need to feed a bigger crowd, 15 rolls in a 10×15 baking pan. Before I had this homemade cinnamon rolls recipe, I was addicted to Cinnabon cinnamon rolls. They were large, soft, and gooey. I’m all about the gooey. I searched and searched (mostly recipe books because recipe websites were not a huge thing back then) and finally found a key idea. Add heavy cream to the cinnamon buns before baking. THIS is the secret ingredient and what makes the rolls rich and gooey. Cinnabon copycat recipe? That’s not what I was going for, but I think we pretty much got it. Here’s how you do it. 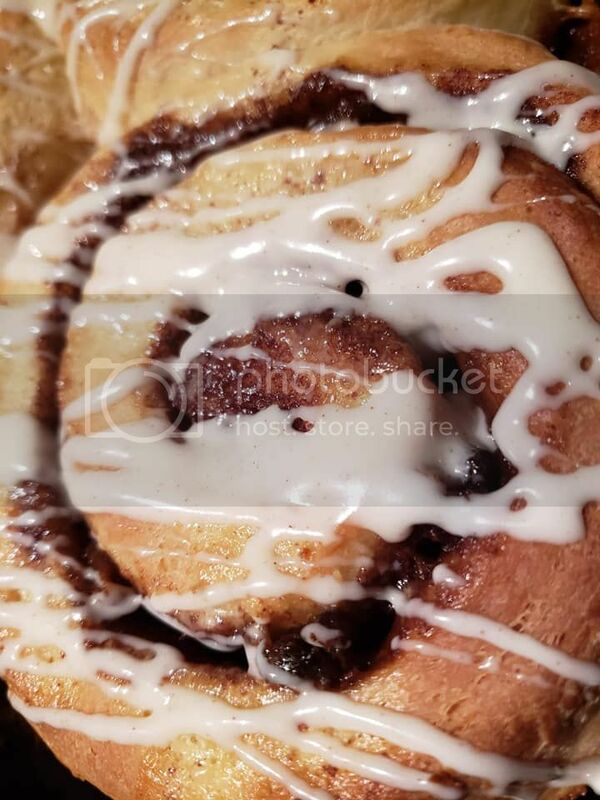 After the cinnamon rolls are rolled into their pretty swirls and you’ve allowed them to rise in the pan…right before they are ready to bake, warm heavy cream in a small bowl. Why warm the cream? Because your rolls have risen in warmth and you don’t want to add refrigerator-cold cream to your cinnamon rolls. Adding warm (not hot!) heavy cream will keep the rolls rising as they should during baking. Pour the heavy cream overtop all of the rolls and watch that rich cream soak in and around the cinnamon roll dough. Can you make the cinnamon rolls without heavy cream? Yes. Will they be good? Yes. Will they be as gooey? No. I find that the heavy cream helps the filling of the cinnamon rolls to be smoother and not as grainy. So just try it, K? After the homemade cinnamon rolls have baked and look like cinnamon heaven, it’s time to frost them. You can use a simple powdered sugar glaze or a store-bought fluffy white frosting if you’d like. But we prefer our cream cheese icing. Butter, powdered sugar, cream cheese and extract (either vanilla or maple). You could even throw in a touch of cinnamon to make a cinnamon glaze. We’ve done it all! You can add the icing while the rolls are warm and allow it to soak in, or if you’d like a pretty frosted look, spread the cream cheese icing on when the rolls are at room temperature. We often make the cinnamon rolls and get them to the point of the second rise (when they are rolled out, cut up and put in the pan). Cover and refrigerate until morning. The morning you want to bake them, pull them out of the refrigerate and allow them to rise. Plan about at least an hour for this so you aren’t waiting too long! Then let them do their second rise. Pour on the cream and let them bake. Stand Mixer: Ok, you don’t 100% need this, but it does make life easier. Red Star Yeast: My favorite yeast! It’s so forgiving and I have perfect baked goods, every time. Saigon Cinnamon: The best flavored cinnamon. Pastry Mat: This makes clean-up a breeze. Dough Cutter: I JUST got one of these. What have I done without it all these years? Works as a scraper too, to get stuck-on dough off surfaces. Baking Pan 9×13 or 10×15, depending on what you need. The best homemade cinnamon rolls ever! If you love gooey cinnamon buns, here's the secret ingredient. Everyone raves about these homemade yeast rolls. Pour the warm milk in the bowl of a stand mixer and sprinkle the yeast overtop. Add the eggs, butter, salt and sugar. Add the flour and mix using the beater blade just until the ingredients are barely combined. Allow the mixture to rest for 5 minutes so the flour has time to soak up the liquids. Scrape the dough off the beater blade and remove it. Attach the dough hook. Beat the dough on medium speed for 5-7 minutes or until the dough is elastic and smooth. **The dough will be tacky and will still be sticking to the sides of the bowl. That's ok! Don't be tempted to add more flour at this point. Use a rubber spatula to remove the dough from the mixer bowl and place it in the greased large bowl. Cover the bowl with a towel or wax paper. Set the bowl in a warm place and allow the dough to rise until double. I like to turn on the oven to the lowest setting for 1-2 minutes. Then turn off the oven and place the dough to rise in there. It normally takes about 30 minutes for the dough to rise. Do not allow the dough to rise too much or your cinnamon rolls will be airy. While the dough is rising, prepare the cinnamon filling. In a medium bowl, combine the soft butter, brown sugar and cinnamon, mixing until well combined. Set aside. Sprinkle a pastry mat generously with flour. Turn out the dough onto the pastry mat and sprinkle the top of the dough with additional flour. Flour a rolling pin and roll the dough to about a 12x15" rectangle. Use a rubber spatula to smooth the cinnamon filling over the whole dough rectangle. Starting on the long end, roll the dough up tightly jelly roll style. Cover the pan and allow the rolls to rise for 20 minutes or until nearly double. Warm the heavy cream until the chill is off. Don't make it hot...you just don't want it cold. It should be warm to the touch. Once the rolls have risen, pour the heavy cream over the top of the rolls, allowing it to soak down in and around the rolls. Bake at 375 degrees for 17-19 minutes, until the rolls are lightly golden brown and the center rolls are cooked through. While the rolls are cooling, prepare the cream cheese frosting. In a large bowl, combine the softened cream cheese and butter using a hand mixer. Blend well. Add in your favorite extract and the powdered sugar. Beat until combined. Spread the frosting over the cooled rolls. **Different yeast calls for slightly different proofing methods. We follow Red Star Platinum's temperature guidelines. Please check your yeast packet to see what temperature the milk should be at. *For smaller rolls, cut the dough into 15 slices and use a 10x15" baking pan. *If you only make 12 rolls, you may end up with extra frosting. *I have halved the frosting recipe ingredients since originally posting it. *The Calorie count shows the amount with ALL of the frosting used. There will be less calories in the rolls if you don't use all of the frosting at once. *Time shown does not include time for rising, so this recipe will take longer than 49 minutes. Plan about 2-2 1/2 hours with rising time and everything. I just tried this recipe and I absolutely love it, it was easy and tastes amazing. The only thing I did differently is I only used 1 cup of powdered sugar in the frosting instead of 2 because I liked it better, wasn’t to sweet. I have worked in bakeries for 20 years. I am a cake decorator but did a lot of the baking myself. These hands down are the best cinnamon rolls I have tasted or baked. They are simply fabulous.. thank you sharing your recipe. And you should not compare them Cinnabon … because these are way better than theirs. These were AMAZING!!!! I agree that adding the cream before baking makes them super gooey and extra delicious! Thank you so much for sharing your recipe! Can these be frozen after baking with good results? Is the nutritional information for the entire recipe or for one roll? Oh M Goodness! My family calls these Sin-namon Rolls. The recipe takes a long time and some effort but way, way, worth it. YUMMY! These are literally THE BEST CINNAMON ROLLS I HAVE EVER EATEN! I followed the recipe exactly, except I did leave the cream cheese out of the frosting. Prefect in every way! These were the easiest cinnamon rolls I have ever made, and the most delicious. I made the recipe twice; first, just the way it was written and, of course, it was delicious. On the second go-round, I made some changes to reflect my family’s likes. My husband and I prefer a less wet cinnamon roll rather than an ooey gooey one, so I only used a scant 1/4 cup of heavy cream. Also, we do not like a heavy frosting, so I made an icing instead. Additionally, I used 1/8 tsp of almond extract in the dough. Yum. My husband raves about these rolls. He ate one immediately and then asked me to pack one in his lunch, which I did. Will keep this recipe and plan to make them over and over. Thank you so much for sharing your family recipe. I made tonight and they were delicious. However, I found that i needed more liquid 1 1/2 C of milk as opposed to 1C for 4 1/2 C of flour plus the cook time needed was a lot longer than stated. Other than that they were great. I have been making cinnamon rolls for 40 years, these are hands down the absolute best I have ever made or tasted !!! The dough is soft and delicate. I will never make them any other way again. I doubted the heavy cream and I thought they would be soggy. Nope, sweet, tender, and incredible !! Thank you for sharing !! Hi, are these good for Make-Ahead? If so, where in the process would i stop? We often make the cinnamon rolls and get them to the point of the second rise (when they are rolled out, cut up and put in the pan). Cover and refrigerate until morning, then let them do their second rise. Then pour on the cream and let them bake. Just finished making these…OMG, OH MY GOODNESS, they are so very good. I will never need another recipe, I tried 3 others . I had to use more milk,1 1/2 cups and everything else as written, big hugs to you for sharing Julie. These are so very good!!!! my go-to recipe since i saw your post! love it how it’s very forgiving and soft and delicious and all!!!! For dinner! My question is- have you ever made this recipe in a bread machine on dough cycle? You totally can use a bread machine to mix the dough. Good luck!!! CAN YOU DOUBLE THIS RECIPE??? Or best to just make two separate batches?? Thanks!! It’s best to make 2 batches. I double this recipe every week….it works perfectly…. I just have to bake longer! They are excellent! I thought I read about freezing them in a prior comment , but I can’t find it. Will you please tell about that? Thanks for this recipe. I’ve made them three times, and they’re incredible. I’ve only used milk because I haven’t had heavy cream and they’re still great! I just made these. First, everyone said they were amazing. Second, my plan for next time will be to make two 9×9 pans My rolls puffed out the middle, could have used a little more space. I think I could do tow pans, refrigerate one and have fresh rolls two mornings in a row. Thank you so much! I have been through many recipes for cinnamon rolls and this is hands down THE BEST. I will definitely be saving this recipe for all of my future baking endeavors! The heavy cream before baking is an absolute game changer. Like other, I didn’t put quite as much powdered sugar in the icing and I added a few other spices to the cinnamon mixture. DELICIOUS!!!! I don’t eat dairy so I want to try this with margarine and almond milk. Would you recommend still pouring some almond milk over the rolls to replace the heavy cream? (Trust me, I know it won’t be as indulgent!) have you had any comments or people trying this with success? Thank you!! I’ve not have any one try this. I would maybe use less if you did try it. You might be able to get good results if you find an alternative milk with a higher fat content. Cashew milk comes to mind, I’m sure coconut cream would work but that’s going to give you a strong coconut flavor I think. These are amazing! I followed the instructions exactly and they came out perfect. I think I will use a little les powdered sugar next time. These cinnamon rolls turned out PERFECT. ABSOLUTELY PHENOMENAL. It is my very first time ever making cinnamon rolls. I bumped up the cinnamon to 2 1/2 tablespoons. I actually only had 1 tablespoon of cinnamon left at first, and my dough was already risen!!! I had to wait FOUR HOURS for my mother to come home with cinnamon for me, and during that time I had the dough in the fridge. I was worried it would ruin the recipe! The dough was a little dry on the top when I finally had enough cinnamon for the filling. Nevertheless I continued on, rolled it out with my hands and the side of a cup because i didnt have a rolling pin, spread the filling, added just a handful or two of raisins, rolled it up and bam! Rised again for 40 minutes [I used traditional yeast]. I also added a small handful of sugar and about 1 tsp of cinnamon to the warm cream before pouring it over the risen buns. I used my own icing recipe and added cinnamon to that as well, I just love cinnamon. Okay, huge paragraph over, I am in love with these buns. My whole family is amazed. http://i38.photobucket.com/albums/e134/echohart/cinnabun_zpsqxmw2k6f.jpg They look so beautiful!